DCC is well known for breeding, producing and selecting valuable herd sires. Many of the great sires of the industry have originated in the Dickinson herd. Bulls like Over Kill, Clear Win, The Shadow, Drag Iron, Clear Point, Senator, Mile Marker and the list goes on and on. The matings and identifications of these great herd sires was not easy. If it was easy, everyone in the industry would have a Drag Iron or Clear Point of their very own. The whole process is a slow, meticulous and tedious one. DCC works diligently to use only the best sires in the industry. That may be natural service or artificial. Every pedigree is planned, every mating is studied and researched as to the potential outcome. The young sires have up to six generations of known animals in their lineage. No genetics are allowed with "unknown" or "multiple sire" pedigrees. (It is difficult to know what is going on without adding the guess work of unknown parentage.) At DCC in 2015 there were 565 planned matings. 18 bulls were used natural service and numerous bulls were used by artificial insemination. DCC will use between two and five young herd sires each year for in-herd improvement. The balance of the other bulls raised, who meet the very highest criteria will be available for sale . At this date, 65 young bulls have been retained and are available for purchase. They are located at ranch headquarters, Barnesville, OH. These young bulls were weighed at birth, they have been evaluated for disposition, they were weighed again at weaning time and a 205 day weight is of record. They have a scrotal circumference evaluation and they have been seriously scrutinized for eye appeal. They have attractive colors. Their pedigrees have been planned to utilize the highest quality traits of their parentage. All the bulls are placed in one pen then ones that don't pass the comparative evaluations become freezer beef champions. There is a difference between a good bull and great one which is a constant challenge. At DCC (2015) the most serious young bulls ever raised are available for purchase. DCC will make choices for herd sires and the balance of these young bulls will be available to select from. They are sired by Drag Iron, Rodeo Max, Clear Point, Jamakizm, Top Hand, Juma, Cowboy Tuff Chex, Tibbs, Annex, Lots Of Flair, Clear Win, Winchester, and Drag A Mile . These highly scrutinized young potential herd sires are priced from $1,500 to $2,500 with an occasional $3,500 or $9,000 price tag on a tremendously superior animal. Some very fancy young herd sires with outstanding pedigree and quality parentage are available in the $1,500 to $1,800 price range. This is a price range well within the budget of any serious Longhorn producer even with only a few cows to breed. There are four to six adult bulls available that were sires for DCC . They will be replaced in by younger generations. 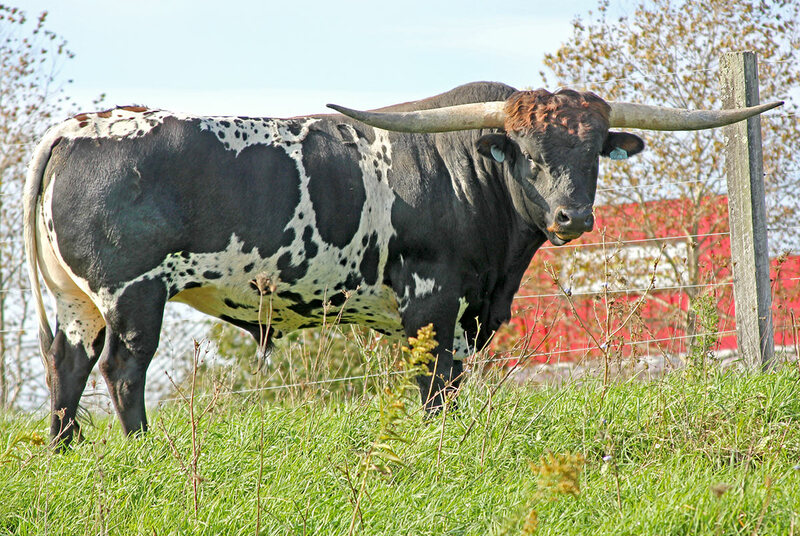 Some of the adult bulls are available on a private purchase basis. These bulls previously selected by DCC are now available privately and the prices are not published. This protects the future buyer from having a stamp of a certain value, where the stigma may never go away regardless of how good the bull's sire record may become. Private sales provide a protective device for future values. For the highest quality young bull you have ever owned, give us a call. We have data and photographs with full pedigrees of every fancy young bull. If $1,500 isn't beyond your price range, and you are seriously raising quality cattle, we are really close to making a deal right up front.